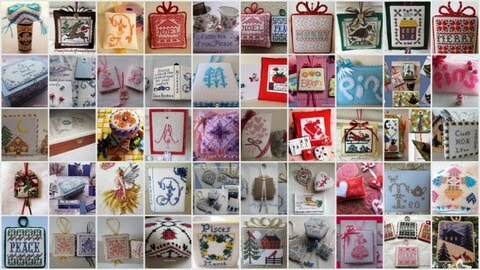 I thought I would show you most of my creations that I made in the year 2009, I have not included a couple of projects because I could not locate the photo's, if there is one thing I have learned from blogging, it is to put my photo's in folders that are a little more organised! I have made over 50 items and I have thoroughly enjoyed making all of them. I have stitched quite a few items for blogging friends and I am looking forward to stitching some more projects for personal exchanges that I have already planned in the New Year, and I am also hoping to concentrate on some of my large work in progress as I have been neglecting them lately. Thankyou for all of your lovely comments throughout the year, I hope you will continue to enjoy visiting my blog in 2010! My favourite ornament in different colours and exchange received from Patti. Hi everyone, I thought I would show you my latest obsession! 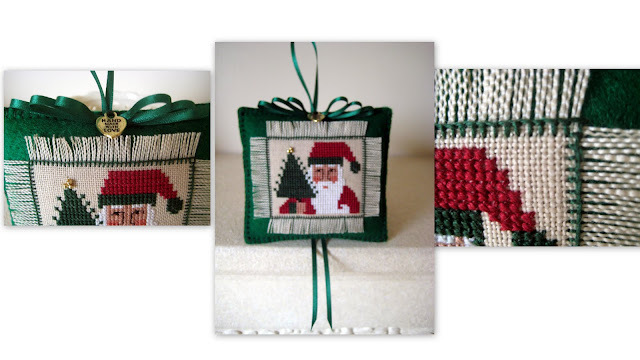 I just love stitching this ornament from the Just Cross Stitch 2008 Magazine designed by Nancy Boyarsky of Glory Bee. I have stitched it about eight times now, I gave two to my sister, one for an exchange, and I made a purple one for a giveaway last Christmas that you can see here. Don't you thing it's amazing how different they look by just changing the colour? I think the reason I like it so much is because I can stitch it in one evening and it is so effective, and I love stitching the rhodes stitch in the middle of each star design. Here are the ornaments showing a close up view, you can click on the photo's. I have also received a beautiful exchange from Patti in the Year Long Prairie Schooler exchange group. Patti made me this lovely thread holder in 40 count Permin linen in 1 over 1 stitching and included a scissor fob and some threads, I was thrilled with it, thanks again Patti! My exchanges are all complete for 2009 and I am now planning one of my first private exchanges for January 2010, I have quite a few planned for next year and I am looking forward to all of them. I am currently making another box to store some of my pins, needles and threads, I will show a picture when it is finished. Hopefully I am going to work on The Porch Swing by Paula Vaughan as I have neglected that one lately. Have a lovely stitchy week and thankyou for all of the lovely comments on my previous post. Finishing instructions for cross stitch box and random act of kindness for Lizzie. 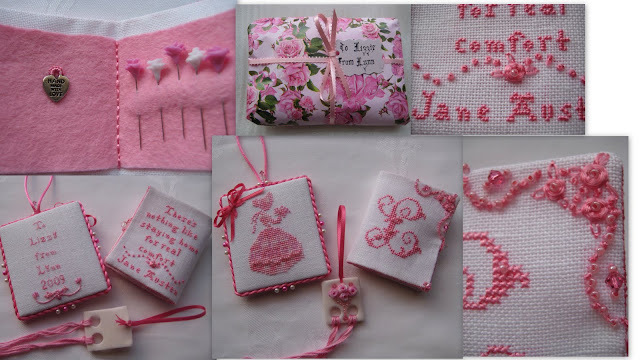 Hi everyone, I thought I would show you my recent random act of kindness that I sent to Lizzie from the Stitching Fairy's Rambling under the Willow Tree. I knew that Lizzie liked Jane Austen so I decided to make the gift around that theme, I made a needlebook, pinkeep, (my pinkeep finishing instructions can be found on this page here) polymer clay flowers and a polymer clay threadholder. My recent visit to Bath where Jane Austen lived for a couple of years, allowed me to find some additional gifts to include, you can see my visit in this previous post here. I designed the embroidery for the needlebook and used an alphabet pattern I downloaded from the internet, unfortunately I have forgotten where I got it from but if you would like a copy please leave a message on this post and I can send it to you. The pattern for the lady is a freebie, I am also trying to find where I got it from! Since downloading these patterns I have made a concerted effort to make sure I keep a record of where I get the patterns from! I decided to make the same pinkeep for myself, I just changed the back of this one. 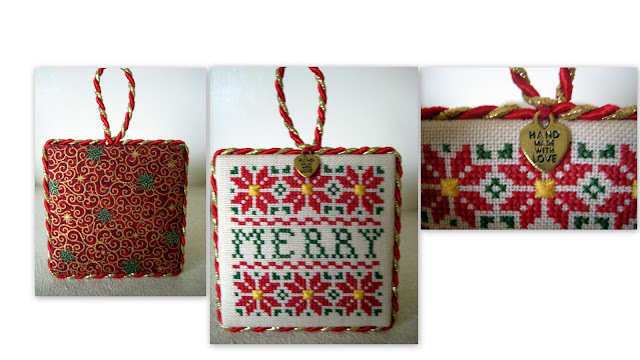 In my previous post I did say that I would show you how I covered this box for the cross stitch Christmas ornaments box that I made for my sister, and here they are. All pictures are clickable for a close up view. Fabric or cross stitched piece to cover the lid - in this case I used silk that had a paper backing on to allow it to go through the printer, you can buy this fabric over the internet. 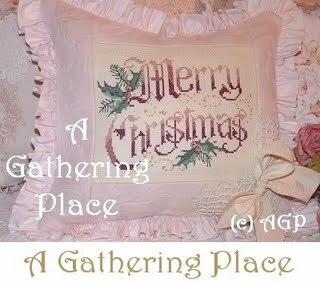 I found a lovely old Christmas image from the Graphics Fairy blog here and printed it on to the silk fabric. Lining fabric for inside the box. Mahogany wood paint/varnish and paint brush. Wadding for padding the fabric on the lid. Cardboard for mounting the fabric - I used 2mm thick white card. Thin card for lining the inside of the box. Cotton thread or quilting thread for lacing. 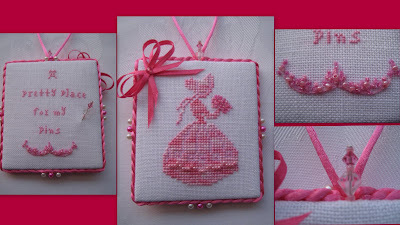 Place the cross stitched piece or printed fabric design face down and place the wadding and then card on top, lace the fabric with strong cotton thread as shown in the picture. I actually backed the silk with thin cotton fabric because the silk was very fine. Do not pull the threads too tight or it will distort the fabric from the front, keep checking the front of your design whilst you are lacing the fabric onto the card. Do the same across the other side so that it looks like this and stitch down the corners neatly. Again, remember not to pull the thread too tight or your design will become distorted and uneven. You are now ready to line the box as shown in the photo below. Draw around the base of your box onto a thin piece of card - I used a folder divider from a file. Measure the edge of your box to cut off that amount around the edge of the card so that it fits snuggly inside the box. This piece of card will be covered with your fabric - in this project I used cream silk. Place the thin card face down but only place glue on the edge of the card on the wrong side, do not put glue on the side that will be visible as it may show through the fabric. Glue edge like this and trim corners. Smooth some glue all over the card. Turn over and your lining should now look like this. Now you are ready to attach the top stitched piece to the box. Put glue on the laced side, paying particular attention to the edges, but be careful not to put too much on the edge as you do not want the glue oozing out at the sides. Place the cross stitched or printed piece on the top of the box and place some magazines on top to weight it down to ensure it adheres fully to the lid. This is where you can go and make a nice cup of tea and put your feet up for half an hour or so! And now for the fun part, gather yourself some nice trim to finsh off. This is the most important part of the finishing and you must try not to rush it, as this can make or break the professional finish you are trying tlo achieve. Start gluing the trim at the point where the join will be least visible, I started at the back of the box in the middle, you could always cover the join with swarovski crystals or beads to give a nice effect. Bring the braid far enough up at the sides to cover where the top meets the box, you do not want a space that can be seen. You should now have a lovely gift for yourself or someone special! I filled this with six of these ornaments and gave it to my sister in time for decorating her tree this Christmas. If you have any questions please do not hesitate to ask, I shall be glad to help! Thankyou for all of the lovely comments on my previous posts, please call again. Box for Christmas Ornaments, Tatting, RAK for Lizzie and an exchange. Gosh, I have had a busy week this week with cross stitch, I have finished a Christmas Ornament box for my sister and filled it with ornament's that I have been stitching since last January, I found the image for the top of the box from The Graphics Fairy blog here, under the Christmas section. I have also just heard that Lizzie from A Stitching Fairy's Rambling Under The Willow Tree has received my random act of kindness, and I have received a lovely tatting gift and an exchange in the mail. Here are the contents of the box above, I gave it to my sister today and she was thrilled with it. The box is covered and lined with silk.I have made a tutorial to show how I covered the box, you can see it here. I received a lovely surprise in the mail this week, it was a tatting gift from Kate, she saw that I liked the idea of learning to tatt and she kindly offered to send me these goodies, needless to say I was thrilled with them, thankyou Kate. Here is the lovely exchange I received from Sharlotte in the Hooked on Exchanging Group, thankyou Sharlotte, it is now hanging proudly on my fireplace! I will show the pictures of my random act of kindness to Lizzie in my next post, for some reason I am struggling to upload the photograph's to my blog for this. Thankyou for all of the lovely comments in my last post! My first flatfold, a gift in the mail and instructions for fringing a small pillow. Hi to all my blogging friends. I have had a lovely week this week, my friend called around for lunch yesterday, we had salmon and cucumber sandwiches followed by cream cakes and plenty of cross stitch chat. My friend bought me a lovely bouquet of flowers and some chocolates, they really made my day very special, thankyou Diane! Whilst my friend was visiting I received a parcel in the post, I thought it was an exchange so I was quite excited about it, however, when I opened the parcel I got a lovely surprise, it was not an exchange but a gift of a tatting shuttle and instruction booklets from a lady who read my blog and saw that I would like to take up tatting, or at least make an attempt. She asked me for my address and she sent me this lovely gift, I was so thrilled. I will post a picture on my next post. Thankyou Kate, it was very kind of you. I thought I would attempt a different finish on this gingerbread house and so I decided to make a flat fold, I am going to trim it with a polymer clay cane in red and white to match the design but I have not got around to it yet, and it may be after Christmas before I do, so I thought I would show the picture's now. It is from The Gift Of Stitching Magazine 2008, Issue 34, page 42 and the designer is Olive Dyck of Olive Hope Designs. I stitched it on 25 count Dublin Lugana linen in pale blue. I have been asked on a number of occasions how I do the fringing on my little pillow's, so I have decided to put together some finishing instructions. This is the pillow that I showed in my previous post. Cut the fabric exactly along the thread line of the fabric. Pin the fabric in place onto the felt. Count the thread lines from the design edge, in this case you can see I have counted two thread lines from the edge and started the blanket stitch. When you turn the corner you will still need to count two thread lines from the edge to ensure it is perfectly square. See the picture below. When you have stitched the blacket stitch all around, only then do you pull out the threads to create the fringing. If you have cut it straight along the thread lines at the beginning you will not have any problems here, however, please be careful when you are stitching the blanket stitch, ensuring that you do not pull it out of shape when stitching it to the felt backing fabric. Cut another piece of felt the same size as the front and blanket, stitch it together leaving a small opening for stuffing the pillow and then continue blanket stitching to close it together. Now you are ready to trim it how you wish. Hi everyone, I hope you are all nearly ready for Christmas! Here are the christmas ornaments I made for two recent exchanges, the red one was for Margaret in the Hooked on Exchanging blog and the green one was for Pilar in the Year Long Prairie Schooler blog. I have been asked how I do the fringing on my ornaments, over the next few weeks I will post pictures showing how to do it. Blog update and a mishap! I have recently managed to change my blog to a three column blog, it has taken me absolutely ages to try and work out how to do this so I am thrilled I finally managed to do it, unfortunately I made a huge mistake whilst playing around with the codes, I accidentally deleted all the blogs I like to read. It has taken me ages to create this list of blogs I like to visit so I am really quite annoyed with myself, now I will have to try and find them all again! lol!!! I have sent a random act of kindness, when I receive news that it has arrived I shall post pictures. I have also completed all my exchanges for this year, I am still waiting to receive mine, but I am really looking forward to the post arriving everyday! Have a happy stitchy week and thanks for the lovely comments! Tea if you please and a giveaway! I know its been a while since I last posted but I have been quite busy of late doing other things, although I have still been cross stitching. I still have quite a few Christmas ornaments that need finishing and I have been stitching a gift for a friend, I will be sending that in the mail this week and when it arrives I will post pictures. my giveaway in July and this one that I decided to make for myself, I am going to hang it on the door in the kitchen where my tea is stored. Of course I had to make a fimo clay teapot to top it off! I so love my new teaset, I bought it in the summertime, the strawberries are so cute and I just love the colour, I really love strawberry designs on anything but I particularly love it on cross stitch. Now for some news of a beautiful giveaway over at Rebecca's blog - Gathering of Thoughts here , trust me if you like the romantic theme you will love this blog. Rebecca creates the most beautiful things, on this occasion she is giving away this gorgeous Christmas pillow in the picture below, go over to her blog and check it out, you won't be disappointed.Oh I so want to win this! I am hoping to plan a giveaway for Christmas if I get chance, so keep a look out for that. I have also sent out this week my last two exchanges for Christmas, one for The Year Long Prairie Schooler Exchange Group and one for the Hooked on Exchanging Group. Thankyou for all of your lovely comments, I hope you have a happy stitchy week!